WordTemple on the air WordTemple is hitting the air! For those who've enjoyed an evening of wordplay at the monthly Copperfield's Books gigs, Katherine Hastings' acclaimed poetry series no longer requires a car, as it makes its radio debut. On KRCB 91.1-FM, one can relive the Ginsberg and Kerouac era with a beat poet like Michael McClure or listen in for a discussion about James Broughton, the late poet, filmmaker and gay-pride advocate. WordTemple airs on the third Wednesday of each month on KRCB at 7pm. Look for the first show to debut on Wednesday, April 18. . . .
Healdsburg Walking Literary Tours Just what exactly do bagels, booze and boys all have in common? The answer can be found at the Healdsburg Walking Literary Tours, where on April 14, Dylan Schaffer's Life, Death & Bialys is featured in this new series pairing walking and talking with a "meet the author" book-signing luncheon. Schaffer's Life, Death & Bialys is slated for Saturday, April 14, followed by the Organic Cook's Bible on April 21 by the Press Democrat's own Jeff Cox. Regardless of where the luncheon is held, count on Cox to have the calamari. 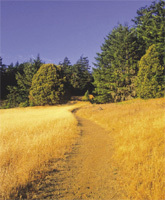 Check out www.healdsburgwalkingtours.com or call 707.484.6249 for more information. . . .
Circling Mt. Tam Circumambulating Mount Tamalpais' 15 miles is quite an endeavor. Although there are plenty of rest stations for those who don't wish to traverse the Rubicon, the new book Opening the Mountain: Circumnavigating Mt. Tamalpais--A Ritual Walk by authors Matthew Davis, Michael Farrell Scott and Gary Snyder may be a good introduction. Featuring breathtaking photography, readers can learn about the journey, which was first undertaken by Bay Area poets Allen Ginsberg, Philip Whalen and Gary Snyder, all of whom have found spiritual refreshment in nature. With a schedule akin to the layout of Stonehenge, the next walks around the mountain are scheduled for those Sundays--June 24, Sept. 23 and Dec. 23--that fall on the nearest solstice. For those interested in future walks, contact Candace Abbott at [email protected] . . . Writer's Workshop A trip to the dentist, a visit from the IRS or Thanksgiving with the in-laws--most writers would prefer any of these to developing writer's block. Fear not, aspiring scribe, A Writer's Sampler is here to smash through that block and get to the meat of the story. Throughout April, this writing workshop will impart such knowledge as finding oneself through writing, developing the fine touch for dialogue, the difficult process of revision and the select few who get to write a memoir. On April 16, Jean Hegland, noted author of Into the Forest and Windfalls will reveal "Dialogue as a Story-Telling Tool." April 23 showcases poet Terry Ehret's workshop "Creative Revision." And finally, on April 30, Clara Rosemarda will present "Layering Memory with Meaning: The Art of Writing Memoir." Classes are Monday at 7pm at the Sebastopol Center for the Arts, 6780 Depot St., Sebastopol. $15 per class. 707.829.4797. . . .
Great Books Weekend Bask in William Faulkner's sprawling epic of a Southern family in ruin and then beat a hasty retreat to Marshall for oysters and wine? You bet. A literary aficionado could not ask for much more than a conversation about Faulkner's The Sound and the Fury followed by plenty of great food and drink. The San Francisco area Great Books Council is the smarter, more classical answer to Oprah's book club (which is doing three Faulkner classics this summer), hosting literary weekends that include lodging, meals and social gatherings for like-minded individuals looking to discuss the finer points of literary classics for a measly 140 bucks. Faulkner is the focus Aug. 25-26 at Walker Creek Ranch in Marin County. For more information about the weekends, log on to www.grreatbooks-sf.com or call registrar Mary Stuart at 707.575.1984.